Miss Universe 2017, 66th Miss Universe pageant was held at The AXIS at Planet Hollywood in Las Vegas, Nevada, United States on Nov 26. Steve Harvey along with the Forbes highest earning model Ashley Graham hosted the wonderful event with 92 beauty pageants globally participated at Miss Universe 2017. Demi-Leigh Neil-Peters of South Africa is coveted with Miss Universe 2017. Knocking down 92 beauty pageants, Demi-Leigh Nel-Peters is crowned with Miss Universe 2017. The second runner up for Miss Universe 2017 is Davina Bennett of Jamaica and the first runner up is Laura Gonzales of Columbia. Below is video of Nel-Peters being crowned Miss Universe. Out of 92 beauty pageants participants, only 16 got selected including four wild card entries. For the first time in the history of Miss Universe , the pageants were grouped into four geographic region: The Americas, Europe, Africa and Asia Pacific, and Wildcard. Also Read: Miss World 2017: After 17 Long Years, India’s Manushi Chhillar Crowned Miss World 2017! The four wild card entry went to Venezuela, Jamaica, China and Philippines. After 16 contenders walked for the ‘Best in Swimsuit’ round, 10 contenders were selected to walk ‘Best in Evening Gown’ round. After eliminating another 5 contenders from ‘Best in Evening Gown’ round, only top 5 contenders could make it to Q&A round. The top 5 countries to contend for Q&A round at Miss universe 2017 were: South Africa, Venezuela, Thailand, Jamaica and Columbia. After Q&A round, the three finalist of Miss Universe 2017 were : Jamaica, Columbia and South Africa. Steve Harvey had this question for the last three finalists and the best answer took home the crown of Miss Universe 2017 : What quality in yourself are you most proud of and how will you apply that quality of your time as Miss Universe? The last round had a cut throat competition between Davina Bennett of Jamaica, Laura Gonzales of Columbia and Demi-Leigh Nel-Peters of South Africa. 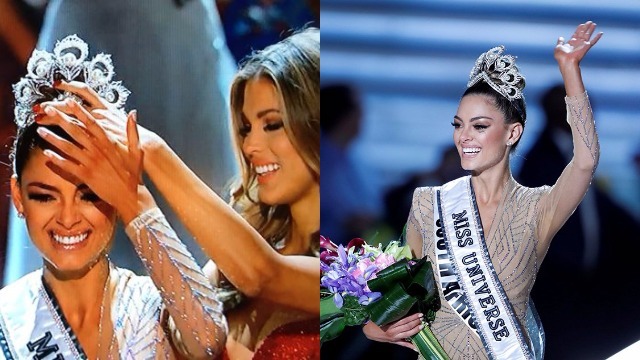 Last year’s winner, Miss Universe 2016 Iris Mittenaere passed the crown to the most deserving Demi-Leigh Nel-Peters. Iris Mittenaere was also a judge jury at the Miss Universe 2017. Nel-Peters will take a year long salary, a luxury apartment in New York City and more prizes. Next : Royal Engagement: Prince Harry Is Engaged To Meghan Markle, Priyanka Chopra, Barack Obama Wishes The Couple!